January 19, 2012 – The Federal Aviation Administration (FAA) yesterday broke ground for a new $16.4 million, state-of-the-art airport traffic control tower at Fort Lauderdale Executive Airport. The new tower, equipped with the latest radar, communications and weather technology, will enable air traffic controllers to continue to provide the safest, most efficient service to flights at the busy South Florida airport. NextGen is a comprehensive overhaul of the National Airspace System to make air travel more convenient and dependable, and ensure flights are as safe, secure and as hassle-free as possible. The new facility will include a 117-foot-tall air traffic control tower topped by a 525-square-foot tower cab. A 7,200-square-foot single-story base building will house training rooms, administrative offices, and equipment rooms. 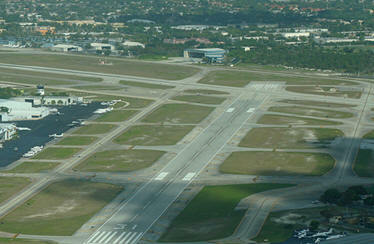 Air traffic controllers at Ft. Lauderdale Executive Tower handled 162,000 takeoffs and landings in 2011. The airport primarily serves general aviation traffic. The construction contract for $9.282 million was awarded to J. Kokolakis Contracting, Inc., of Tarpon Springs, Fla. Design and installation of equipment accounted for the remainder of the total $16.4 million cost. The new tower will be commissioned in spring 2014, replacing the existing tower that was commissioned in 1970. Fort Lauderdale Executive Airport is a general aviation airport located within the city limits of Fort Lauderdale, in Broward County, Florida, United States, five miles (8 km) north of downtown Fort Lauderdale. It is a division of the Community and Economic Development Department of the City of Fort Lauderdale. The airport was built in 1941 to train Naval Aviators during World War II, and named West Prospect Satellite Field. In 1947, the federal government deeded the airport to Fort Lauderdale for use as a public airport. The airport serves over 250,000 aircraft operations per year, making it the eighth busiest General Aviation center in the United States. The airport is designated as general aviation reliever facility for the Fort Lauderdale-Hollywood International Airport by the FAA. The airport is a port of entry with a full service Customs facility. The airport also operates a 24 ARFF facility that meets the requirements of index B, although the airport is not certificated under FAR Part 139. ARFF services are provided by Fort Lauderdale Fire-Rescue.